Valery Sozaev. May Day / Easter — ЛГБТ-служение "Nuntiare et Recreare"
This year Easter on the Julian calendar fell on the same day as the International Workers’; Day – May 1 st . For the past few years I had been part of the rainbow column at the May Day march. The May Day march was an opportunity for the St. Petersburg LGBT movement to voice the concerns of the LGBT community. It only felt right for our LGBT column to be part of the Democratic March. However, this year saw drastic changes – for the first time in many years the Democratic March was not authorised. For some LGBTs there remained the option of joining the leftist column, but carrying rainbow flags in the labour union column was banned by personal order of the chair of the MPRA. As a result, a number of allied organisations and initiatives, such as the Russian Socialist Movement, the Russian Social-Democratic Union of Youth and the Radical Feminists, decided to withdraw from the march in solidarity with LGBTs… The news of all these challenges reached me the night before May 1 st when I returned from the “Community-based testing” training course which I had left early for the purpose of taking part in the march of the Rainbow LGBT column. I am a Christian and to me Easter is a key concept. “Christ is risen” — these words are central to my existence. The message of the resurrection of Christ is the message of the absolute possibility of the impossible. To me the resurrection unfolds the supreme message of freedom in Christ. Death as the final, supreme imminence is overcome. And in this overcoming of death a new creation is shaped, a creation that is no longer subject to the curse of sin, which is separation from God. In that sense I understand sin as a lack of honesty to oneself, as a rejection of one’s dignity. Human beings were made in God’s likeness. And denying one’s dignity means erasing the image of God in oneself, neglecting the ability to love which God has placed inside us. It is about being unfree and submitting to the “law of sin” — submitting to the system of oppression which dehumanises people and makes them slaves to widely accepted customs, rules and stereotypes. As a gay man in a heterosexual world, in a frame of society where heterosexuality is proclaimed to be the only “normal, proper and natural” sexuality, I am faced with a choice: either to accept the rules which the world is imposing onto me, to pretend that I don’t exist and stay forever nailed to the cross of heterosexism and homophobia, or to open up to the movement of the Holy Spirit and come back to life as a gay man with a sense of dignity, having performed a radical act of will, having accepted my God-likeness as a being with the ability to love and be loved. That is why there was no real dilemma as to whether I should go to the May Day march. There isn’t a single frame of society that could “authorise” my existence: I have come out, I am out, therefore I exist. Not a single frame of society can “ban” me – I exist and I’m not going back into the closet. Unfurling the Rainbow flag was my Easter, it was an action of my gay liberation theology, it was a moment of my unity with the risen Christ. At the start of the 21 st century the Rainbow flag became what the Cross of Christ once was – a symbol which causes legions of homophobic demons to tremble and be filled with fear. The Cross of Christ proclaimed the message of God’s radical love and today the same message is proclaimed by the Rainbow flag. Christ does not show favouritism, nor is he elitist. It’s hard to imagine anyone more egalitarian than Christ. He doesn’t just overthrow hierarchy when he lifts up the lowly. He destroys hierarchy in a radical way when everyone receives “equal pay” regardless of when they were called. I find it symbolic that, for the main part, the “solidarity of workers” didn’t pass its own test in the end, because today here lies the main and fundamental dividing line between the old heterosexist, homophobic world which is still governed by its slavish laws, and the new world in which the risen Christ asserts freedom, equality and dignity for all. P.S. : It was my personal decision to unfurl the flag and I alone am responsible for it. 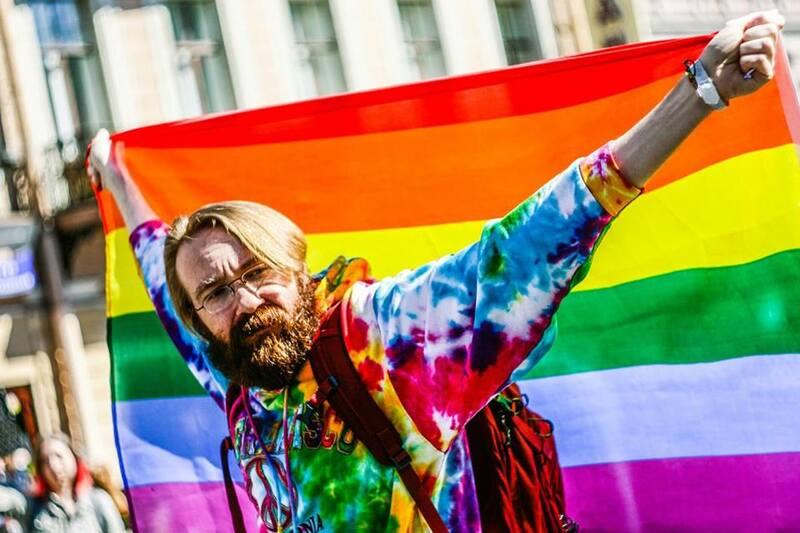 But seeing some LGBTs and our allies unfurl the Rainbow flag of our dignity throughout the demonstration and the huge flag that was unfurled at Anichkov bridge as well as posters with anti-homophobic slogans was a testimony to the fact that we exist, we are here and nothing and no one can make us hide again. I’m proud of each and every one of you. P.P.S. : And, of course, thank you all so much for your support after I was detained. That support is as meaningful a testimony to the fact that change in the world is possible.